The moment arrived, with 3 years from its publication the first version of the 7th branch of PHP, version 7.0 has reached its end of life, EOL. 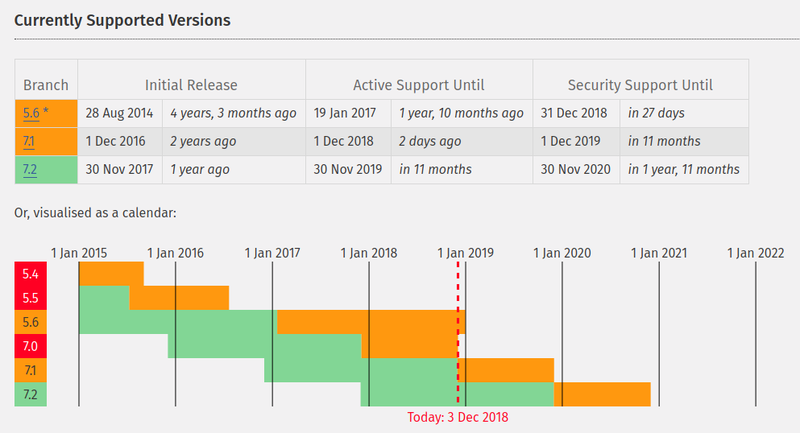 Just today December 3th (2018) has officially finished the support of this version, and on January 1, 2019 it will be the PHP 5.6 version support, which has maintained an extended support with more than 4 years noticing it has only half the performance of the versions of the 7 branch. In the meantime, versions 7.1 and 7.2 will continue with support, as shown in the graph. Also it is expected than during the same week we’ll have the release of version 7.3, which will be the fastest version to date. For this reason and given that we maintain a continuous maintenance cycle on our platforms, we have set the minimum execution version of our PHP-based websites in version 7.1, which will continue to receive security corrections until December 1, 2019. In Software, It & amp; Networks , we work constantly to provide services and products that meet the industry’s safety and quality standards, we invite you to contact us if you have any questions regarding your website or application and review your specific case. We hope you have an excellent start to the week.